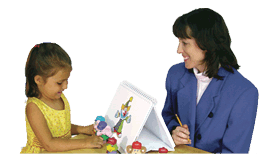 The following information, as taken from Language LAB™ by JoAnn Wiechmann, M.A., CCC-SLP, Judy Rudebusch, Ed.D., CCC-SLP, and Nancy Kuhles, M.S., CCC-SLP, provides an overview of oral and written language skills and narratives. Success in school is highly dependent upon a student’s ability to understand and use both oral, conversational style language and formal, literate style language. We find literate language in written and other formal modes of communication, such as those used in scientific papers, essays, and lectures (Paul, 2007). It is highly decontextualized in that all of the information needed for comprehension is within the linguistic signal (i.e., the words, sentence, or paragraph rather than the nonverbal cues of gestures, tone of voice, or facial expression). Narrative discourse falls between oral, conversational style language and the formal, literate style of language needed for success in school (Westby, 1991). Narratives serve as a natural bridge between oral and literate language because they rely on a formal structure (story grammar); yet, they also contain dialogue that is more like an informal conversation. Narrative skills are very important in predicting success in school. Intervention that provides explicit support for students in developing strong narrative discourse ability can reduce failure and support students in taking on strong literacy skills (Bishop & Edmundson, 1987; Boudreau, 2006; Feagans & Applebaum, 1986; Tabors, Snow, & Dickinson, 2001). Research proves that vocabulary knowledge, story comprehension, and story sequencing are the language skills that have the strongest relationship to improved reading outcomes (Snow, Tabors, Nicholson, & Kurland, 1995). Paul (2007) developed the following continuum to explain the transition from oral to literate language. Oral, conversational language is the least formal style of language. It is usually highly contextualized with information that supports the exchange such as objects being discussed, facial expressions, gestures, and intonational cues. Narratives rely on a familiar structure, a story grammar that provides support for comprehension. Narratives are monologues rather than dyadic, but they contain dialogue that is similar in style to conversation. Narratives are in a middle ground between familiar oral language styles and more difficult literate forms. Literate language styles appear in written and formal modes of communication such as research papers, essays, and lectures. It is highly decontextualized in that all the information needed for comprehension is within the linguistic signal itself rather than environmental cues. Bishop, D., & Edmundson, A. (1987). Language-impaired 4-year-olds: Distinguishing transient from persistent impairment. Journal of Disorders of Communication, 21, 321–338. Boudreau, D. (2006). Narrative abilities in children with language impairments. In R. Paul (Ed. ), Child language disorders from a developmental perspective: Essays in honor of Robin Chapman. Mahweh, NJ: Erlbaum. Feagans, L., & Applebaum, M. (1986). Validation of language subtypes in learning disabled children. Journal of Educational Psychology, 78, 358–364. Paul, R. (2007). Language disorders from infancy through adolescence (3rd ed.). St Louis, MO: Mosby, Inc. Snow, C. E., Tabors, P. O., Nicholson, P. A., & Kurland, B. F. (1995). SHELL: Oral language and early literacy skills in kindergarten and first-grade children. Journal of Research in Childhood Education, 10, 37–48. Tabors, P. O., Snow, C. E., & Dickinson, D. K. (2001). Homes and schools together: Supporting language and literacy development. In K. K. Dickinson & P. O. Tabors (Eds.). Beginning literacy with language: Young children learning at home and at school (pp. 313–334). Baltimore, MD: Brookes. Westby, C. (1991). Learning to talk – talking to learn: Oral-literate language differences. In C. S. Simon (Ed. ), Communication skills and classroom success (pp. 181–218). San Diego, CA: College-Hill.